I consider myself to be a strong, independent, modern woman. In my view, men are not my "enemy"; wearing a minidress is not "objectification" and taking pride in my femininity is not a "betrayal of womankind". At the same time, I expect to go to university, have my own career and make my own money, because that's how I choose to live. If a woman chooses to stay at home and dedicate herself to looking after her partner and children, I do not see her as any less important that a woman who chooses to remain childless and focus on a high-powered career. She should be allowed to do what she feels is in her and her family's best interests, without being ostracised by society for "forgetting her place" or "submitting to the patriarchy". Now we've got that all clear, I am going to discuss how women's issues relate to the EU, and why we're better off out. Project Fear has targeted women among other "vulnerable groups". We have been told that our hard fought for rights will all go out of the window if we Brexit. This is totally untrue, and the scaremongering from the Remain camp is not only absurd but also incredibly patronising. The Suffragettes were not funded by the EU - It didn't even exist when women got the vote under the Representation of the People Act 1918. It also had no part in subsequent amendments that led to women and men getting the suffrage on equal terms. The Divorce Reform Act 1969 widened the grounds for divorce to irretrievable breakdown, before the UK joined the EC. The first woman to take her seat in the house of Commons was Nancy Astor, in 1919. The first female minister was Barbara Castle, in 1965. Margaret Thatcher became the first female PM in 1979. Betty Boothroyd became the first female Speaker of the House of Commons in 1992. None of these women were appointed by the EU. The point that I am trying to make here is that British women do not rely on the EU to fight for and preserve their rights. Pretty much all of it has been achieved through activism and the democratic process, so don't let anyone tell you that you are too weak and feeble to do without the EU. Almost every day for the past couple of weeks, I have seen or heard the Remain camp arguing that the EU protects women's rights to paid maternity leave. They imply that, without the EU, paid maternity leave would be abolished or greatly reduced. This isn't true. Let's start by comparing UK and EU law on maternity leave. Under EU law, women are entitled to at least 14 weeks' maternity leave. They must be paid at a rate at least equivalent to sick pay. Now, if a woman was granted this in the UK, her employer would be in a lot of trouble. Under UK law, women are entitled to 52 weeks' leave, 39 weeks of which are paid. Pay is 90% of the woman's average weekly earnings for the first six weeks, then either the same or £140 per week for the next 33 weeks. Clearly, UK law offers a far better deal. So, to say that Brexit will damage maternity rights is very misleading. Frankly, trying to frighten women to vote Stay by telling them they'll lose these rights is totally unjustified and it screams desperation. This whole affair, in my opinion, demonstrates how backward the EU can be. Women's sanitary products are currently subject to a reduced rate of VAT (5%), which is the lowest rate permitted for these products under EU law. Not long ago, 300,000 people signed a petition against charging any VAT on sanitary products, which prompted a debate in the House of Commons and the threat of a Tory backbench rebellion over the Budget. This would have been a humiliating defeat for the Government and the Remain camp, so the Chancellor and the PM had to do something. It was later announced that the European Commission had reached an "agreement" to include proposals for greater flexibility for member states to set VAT rates in its "VAT Action Plan". It is worth noting that this was merely an "agreement", and not a legally binding piece of legislation. Of course, that didn't matter because the Chancellor was able to toddle off back to the Commons to declare a wonderful victory. It also helped the argument for staying in the EU because it looked like the UK had secured reform. The Budget was passed and the Government avoided embarrassment. What fantastic news! The EU can and will reform, so Britain must remain a member state and reform it from within. After all, it worked with the Tampon Tax, didn't it? No, it didn't. Earlier this week, it emerged that the EU has failed to include reduction in VAT for sanitary products in its "Action Plan". It also turns out that the European Parliament voted against reducing VAT on tampons as well. The Establishment won this one. The EU got what it wanted as it has wriggled out of negotiating on the Tampon Tax, and the Government got what it wanted as it managed to fool MPs into passing the budget and the public into thinking that Britain has any influence in the EU. The will of the British people - expressed via rebel MPs and the petition - has been defeated by a group of people we didn't vote for and cannot remove (or even name, for that matter). The fact is, women get periods. Sanitary products are essentials for the sake of hygiene if nothing else. An institution that essentially taxes women for being women is, in my opinion, hugely sexist and bigoted and we shouldn't need or want to be a part of it. I hope that this article has helped to clear up a few things with regard to how women really benefit (or not) from Britain's membership of the EU. It also shows that much of what is currently being put out by the Remain camp is incredibly misleading and actually amounts to quite an unethical campaign. 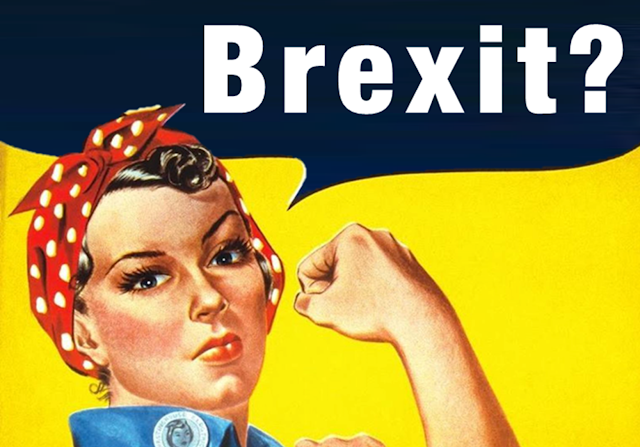 I hope that the women of Britain vote to leave this backward institution, which has been sluggish at best when it comes to protecting and advancing women's rights.